Romania has participated in the Eurovision Song Contest 18 times so far, debuting in the 1994 contest. After the 1994 contest Romania had a four year Eurovision hiatus, and has since participated in most years (with the exceptions of 1999 and 2001 due to poor showings in 1998 and 2000 respectively). Their best result came in the Eurovision Song Contest 2005, when Luminiţa Anghel and Sistem helped the country to 1st place in the semifinal and to 3rd place in the grand final. In 2006 Romania was represented by Mihai Trăistariu who became one the favorites to win but he failed and placed 4th receiving points from every country except Netherlands and Monaco. In 2007 Todomondo failed to place in the top 10. In 2008 Vlad and Nico placed 20 and in 2009 Elena Gheorghe placed 19. In 210 Romania is back among the favourites winning the top 3 spot with “Playing with fire” sang by Paula Seling and Ovi. Following this big succes, Romania manages some average places in the next 3 years: 2011- place 17 with Hotel FM, in 2012 – place 12 with Mandinga and in 2013- place 13 with Cezar. Hopefully this year we will be back in top 10…..And they are not. 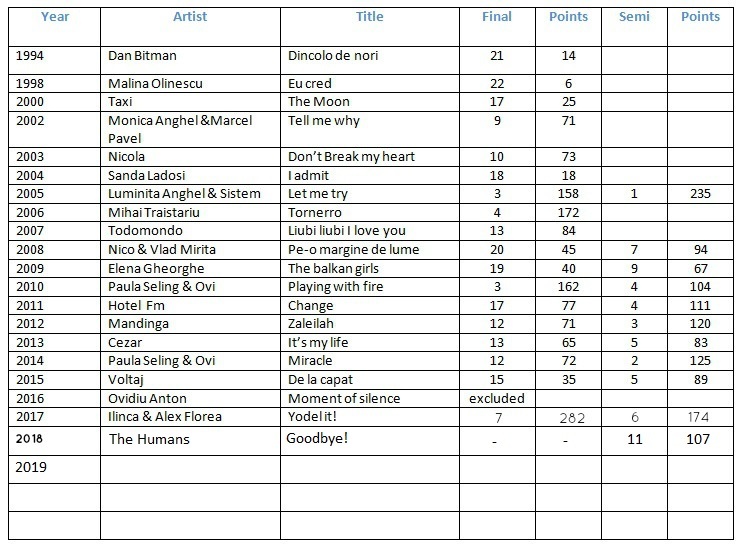 Paula and Ovi placed 12th with 72 points for Eurovision 2014. The top 10 was far from happening in 2015, with Voltaj placing 15th. In 2016 Ovidiu Anton won the national final held in Baia Mare, but one week before embarking for Stockholm, EBU decided to eliminate TVR from the competition due to unpaied debts. So Romania was disqualified from the 2016 competition. In 2017 Romania is back with a Bang…or a YODEL!..Ilinca & Alex won the national final and the right to represent Romania in Kyiv. They conquered Europe with their Yodel, and managed a respectable 7th place in the Final. 2018 was the first year Romania didn’t qualify into the Grand Final. Sad moments for us but still we are proud of The HUmans and their performance of the song Goodbye, placing 11 in the semifinal.